Read this primitive marriage of Frezghi. This is a warning to Tigrayans. Tigray should close the border or build a wall to prevent pervert Eritreans before it is too late. Last edited by Thomas H on 12 Apr 2019, 09:33, edited 1 time in total. I could not read the whole thing due to too much laugh. No wonder "Tolcha" says "Wey Maalti"??? 1. Bad habit of Noisy Eating. Eri men have this bad habit of slurping and open-mouthed chewing. When ever they eat their jaws click with each chew. This is really a turn off for many Eri women. 2. Eri men are like sperm. We all know that only 1 sperm out of millions fertilizes an egg. The same with Eri Men. Only 1 in a Million actually works and the vast majorities are welfare recipients. As a tax payer, this should be a concern for all of us. We don`t have to forget that USA is a land of opportunity. 3. Eritrean men are very very bad in bed. Their man hood is abnormally very small. Some of them either lie like a sack of potatoes during seexxx or think that waving their willy in any woman’s direction will induce an orga$m . Some of the Eri women that I talked have also different experiences. For example Ms T(I don`t reveal her name to keep her anonymity) who was married for a short time to a sawa graduate told me that he was pumping her like he was in a horse race and scratching all over her body and at the end her back bone was hurt and her chiropractor bills was sky high. Eri women are sick and tired of coaching them about seexxx. In simple word, Eri men do not know how to turn on a woman. 4. Eri men don`t have seexxxy appeal. They have big belly and skinny legs and this is really disgusting for Eri women. In fact majority Eri women said that most of Eri men are so ugly they can make onion cry. Some Eri men even can turn milk in to yogurt by just looking at it. In fact I was recommended by Eri women to put Eritrean men picture in my car window as an anti-theft device and to my surprise it really worked well.I urge ER forumers to try it. Your car will never be stolen. 5. Finally,this is rumor or it is unconfirmed report. There is a proposal in Washington DC, where there is the largest Eritrean community to change the name Halloween to Eritraween. We all know that Halloween is a time to be very scared. The whole purpose of Halloween is to scare people. People wear masks to scare the hell out f people. Now thanks to Eri men ugliness, you don’t need any mask any more. Stay tuned I will update you once I confirm it. All you blabbered is the product of identity crisis. Uncertainity about being not eritrean and not measuring up to their standards leads to asocial behavior. That's the exact definition to your blabber. 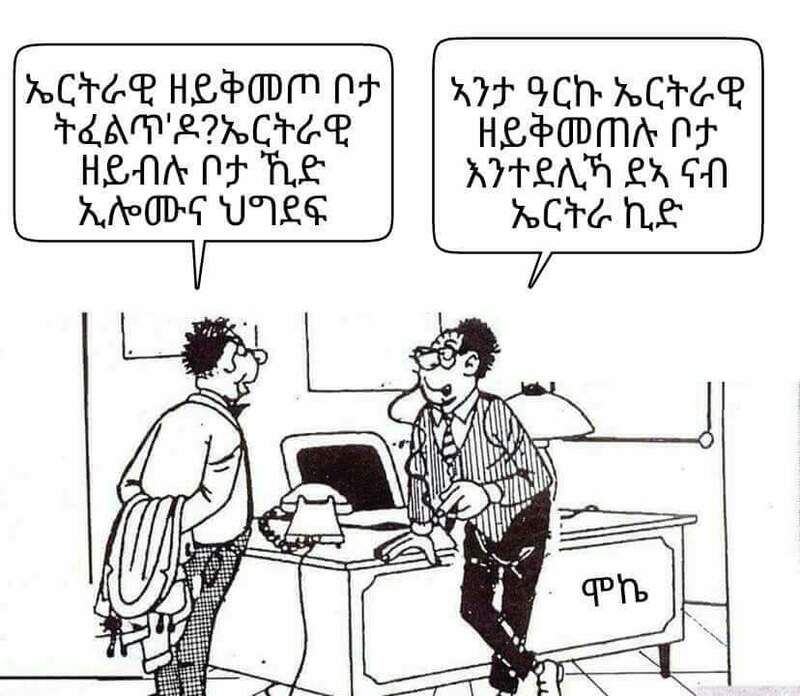 The leitmotif is Ezgi or ‘zgi short form of Egziabiher (Tigrigna for God); the meanings of the prefixes from cradle to grave are: Zere is seed; Tekle is plant; Welde is child/genitor; Gila is literally ‘servant’ or ‘slave of’; Oquba is shelter/refuge; Tesfa is hope; Habte is wealth; Gebre is ‘doing’ but is more of extending support to others, very much like a philanthropist (Gebre-Senay); Fre is fruit/fecundity/reproduction; Nai is literally ‘belongs to’/possessive. Finally Eritreans name their sons Teumizghi when they send them to Tigray in search of jobs.For any Eritrean,it is a dream come true and once in a life time opportunity to go to Tigray.That is why they give them the name Teumizghi..Meaning God is gracious,merciful, compassionate, pleasantly kind, and courteous. Not long ago the migration was the other way round. Tigrayans going to Asmara as “Shekalay” and that was life for most. It’s a normal trend for people to migrate to a friendly place if access is open.